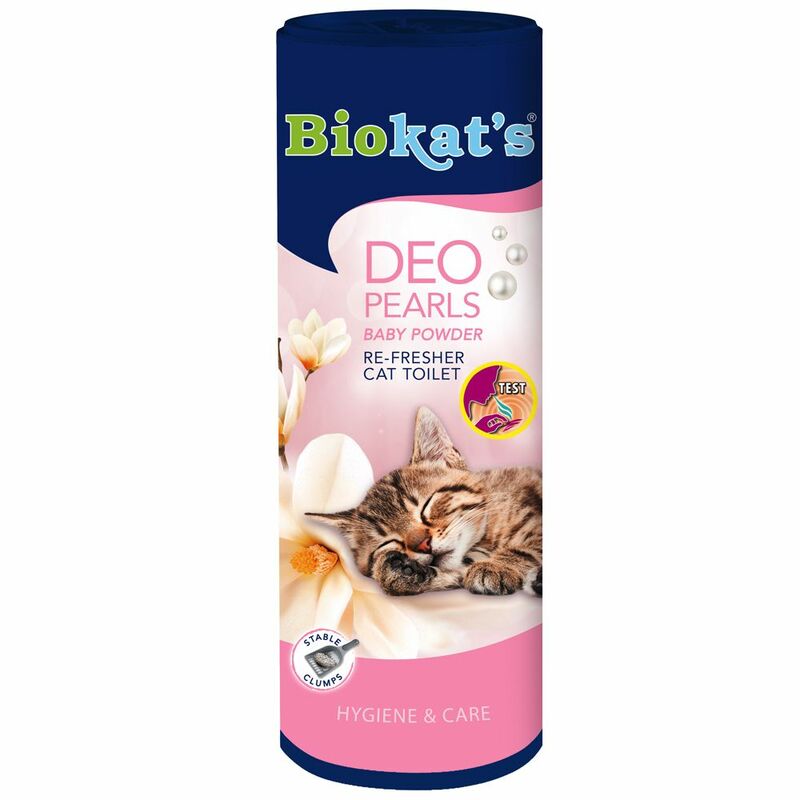 Biokat's Deo Pearls Baby Powder give your cat's litter tray an irresistibly fresh scent. This baby powder-scented litter refresher can be added to your cat's normal litter as often as you like, letting you adjust the intensity of the scent to suit your taste - the more you add, the stronger the fragrance. Biokat's Deo Pearls Baby Powder instantly bind unpleasant litter box odours so you can enjoy the refreshing scent of baby powder. This practical powder also prevents new odours from developing and strengthens the binding action of your cat's normal litter, meaning that it lasts longer and stays fresh. Offer your cat a hygienic-smelling litter tray and appreciate the long-lasting feeling of freshneΒ. Biokat's Deo Pearls Baby Powder at a glance: Sprinkle over unscented cat litter to freshen up your cat's litter box Long-lasting fresh scent: binds unpleasant odours instantly and prevents the build-up of new odours Improves clumping action: increases the length of use and efficiency of your cat's normal litter Easy to use: simply add to your cat's litter as often as desired Variable intensity: use as much powder as you like, as often as you like, to suit your preference Pleasant scent: fresh baby powder fragrance for a long-lasting feeling of freshneΒ Made in Germany Contents: 700g.